It’s June, it’s wonderful, and you’ve just initiated your official summer kickback session. But before you sink into some soft summer grass where you will remain lackadasically wonderful for the next two months, take one last moment to plan ahead slightly. 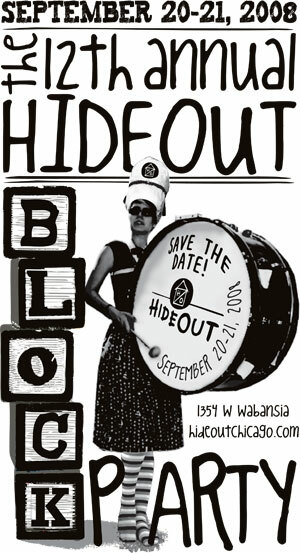 This week the Hideout announced the lineup for their 12th Annual Block Party scheduled to close out a promisingly solid Chicago summer of music. The outdoor festival, dubbed an “increasingly international local music festival”, will take place outside the Hideout on Wabansia Sept 20 - 21. Increasingly international is quite a paradoxically literal stretch here, considering their headlining act from Canada also is the infatuation of American indie fans around, The New Pornographers. We all get a little tingle inside just to know that Neko Case and the rest of the crew will be there in all their Canadian glory. A broken foot sidelined Case for the New Pornos’ show earlier this year, and the remaining members did their best with a disjointed performance, but the full lineup now returns to the Hideout for what’s going to be their only Chicago performance in 2008, and a Neko Case solo act tops everything off. The other acts that make up the “global village” created by the festival hail from four continents, including Plastic People of the Universe, Czech psych rockers that have been driving hard for more than ten years now and Monotonix, who arrange dissonant guitars through melodic hard rock to produce a pleasantly dark sound echoing from their home base of Tel Aviv. Making blips on the scene recently with a very solid 2008 album, Black Mountain will also be appearing, as well as Ratatat, bringing their electronic grooves from the vast, remote area of, um, Brooklyn. Check out The Hideout for the rest of the dynamite lineup. Tickets are on sale now and moving for what has grown from a “glorified back-yard Bar-B-Q to a respected international music festival” that boasted 15,000 people last year. It’ll be $45 for a 2-day pass, the cheapest Chicago festival ticket you’ll buy this summer.